I saved a lot more than I expected to when I went to Walgreens yesterday to buy ONE 12 pack of toilet paper. We buy the Real Soft Walgreens brand because they are large rolls for $5 regular price for a 12 pack which is cheaper than anywhere else around here. Currently Walgreens has them on sale for $3.99 and there is a $1 off coupon in the Walgreens monthly coupon books (the ones by the weekly ad, they always have them) that makes them $2.99 for a large 12 pack. The best part is all of the coupons you need are already in the store. 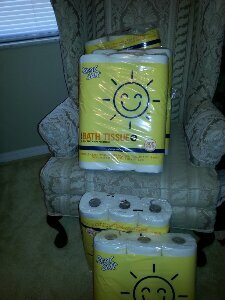 I ended up buying all of our TP for the rest of the month because it was so cheap. We got 5 large 12 packs for $15. I may go back and buy some for next month too. 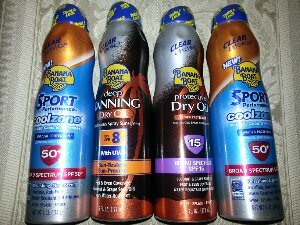 Fantastic Walgreens Banana Boat Sunscreen Deal $1.75 each- Last 2 Days! 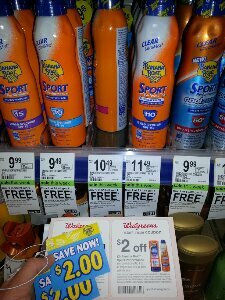 There is a fantastic Walgreens deal right now on Banana Boat Sunscreen, all with coupons you can find in the store. 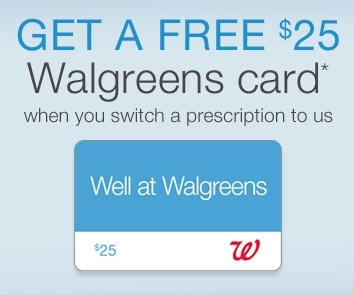 Also if you went to Walgreens last week you should have received a $5 off of $20 purchase coupon that could help make this an even better deal if your before coupon total is more than $20. I ended up buying 4 because in Florida you can never have too much sunscreen! Why did I buy 6 12 packs of toilet paper at Walgreens today? To take advantage of an even better stock up deal than usual. So for $19 we are set for toilet paper for at least the next month. Even when it’s not on sale we usually buy Walgreens $5 Real Soft toilet paper because they are thick rolls that last a while and they are cheaper at full price than when buying TP at regular price anywhere else around here. When they are regular price they are .41 cents per roll which works out to be cheaper than the big box clubs I’ve compared it to. 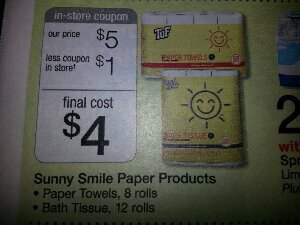 Walgreens often gives out $1 off coupons that makes it .33 cents per roll. Today we only paid .26 cents per roll which is even better. One thing I hate spending money on is toilet paper because it literally goes down the drain. It’s the only paper product we buy in our house so I always try to get it as cheaply as possible. The only household paper product we buy is toilet paper. That’s right, no paper towels, napkins, paper plates, etc. But we draw the line at Toilet Paper. There are some things we aren’t willing to do to save money and going without toilet paper is one of them. 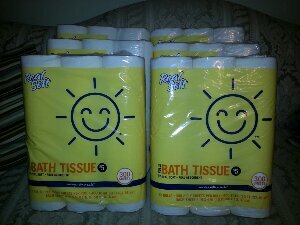 One of the best deals we have found is Real Soft / Sunny Smile Brand Toilet paper at Walgreens that costs $5 for a 12 pack (Aldi has a comparable deal). This month in the Walgreens May coupon booklet you can save an extra dollar with their dollar off coupon. I have included printable link below if you can’t find the booklet that is usually in the front of the store. Usually when I got to CVS and Walgreens I plan my trips around the best couponing deals and prepare accordingly. 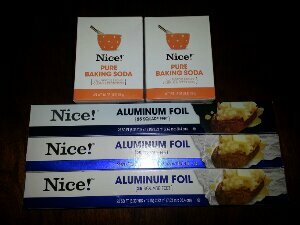 I write a lot about my couponing trips but what happens when you need to go to the store last minute for one or two things that you just have to buy? I really needed mascara and dishwasher detergent. At CVS there was a deal on Almay but it turned out to be a better deal to buy NYC brand, which is cheaper even without a sale. 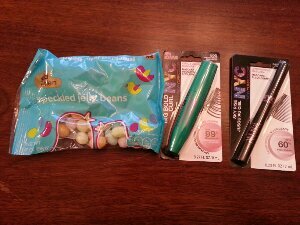 There was an old tag for B1G1 half off of any NYC products and the nice cashier honored their sign and discounted the mascara anyways. She even gave me half off the more expensive mascara in the teal tube. I decided to try the $4.99 teal mascara and the $1.99 black mascara and then compare them so I would know which one to buy in the future. The teal mascara was definitely better. I also bought the Free After ECB (CVS Store Dollars) Jelly beans. Then when I went to buy the dishwasher detergent I realized that it was between $7-9 at CVS and they didn’t have a store brand. 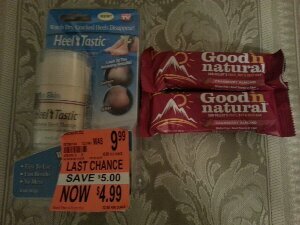 I had a hundred things to do that day but instead of overpaying at CVS I made myself stop at Walgreens on the way home. I made the right choice because luckily it was on sale for $3.99 and I was also able to pick up some cheap .69 cents macaroni which was also on sale. We like to make black beans and macaroni and cheese as a cheap and easy lunch. 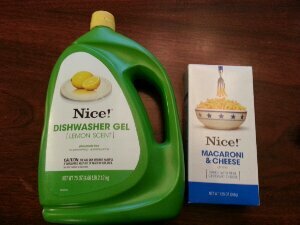 Today’s shopping trips only prove how much money I really save by stocking up when I find great couponing deals on the things I use, but they also show that even without coupons you can still save yourself a decent amount of money by smart shopping. 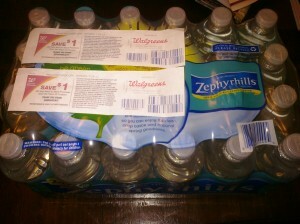 So Zephyrhills 24 packs of water are on sale for $3.49 this week at Walgreens with $1 RRs. However, one of the employees at my local Walgreens was kind enough to inform me that they are in fact printing 2 separate $1 RR coupons. The second actually says Energizer batteries but all I bought in this purchase was the water. This made the water only $1.49 for the entire pack after RRs. I know in some areas the water goes by a different name so I can’t say this will work everywhere or for how long but it might be worth a shot especially if you were planning on buying it anyways. *Shopaholic Savers Deals* are unique deals that the owners of Shopaholic Savers personally come up with and that we have not seen on other sites. Other Bloggers are welcome to repost these deals as long as they also post a link back to us. To see more Shopaholic Savers Deals click the category in the column on the right. I apologize for the lack of updates lately. I’ve been feeling under the weather and today I went to the doctor and found out I have strep throat. Not fun. However, being the frugal person that I am I tried to look on the bright side. 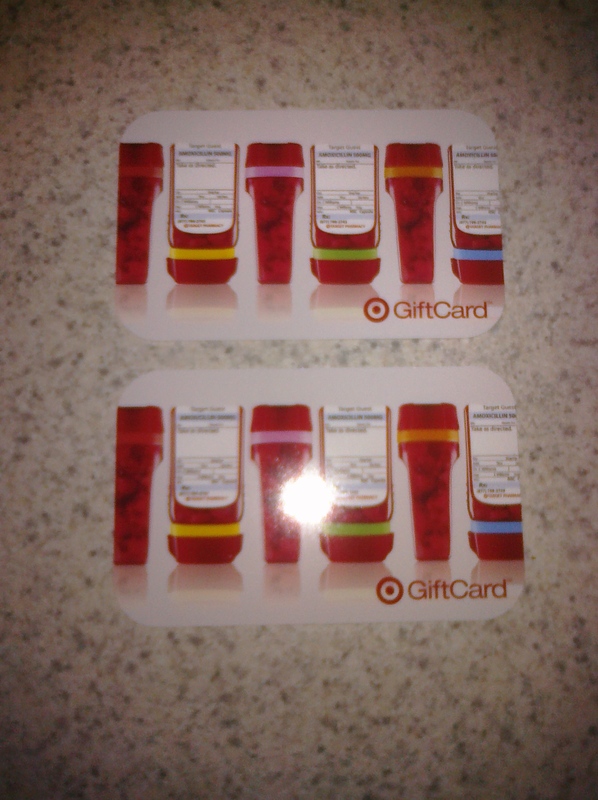 I had to pay $14 for 2 prescriptions but I was lucky and had two $10 Target gift card with a new or transferred prescription coupons. You can get these in a variety of ways- their weekly ad, catalina coupons, or home mailers. I didn’t know that you can use more than one at the same time. I believe the limit is actually 4. So I actually made a $6 profit in gift cards. 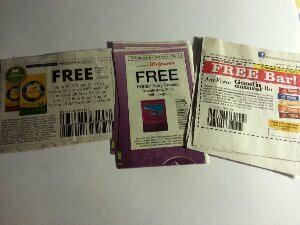 I am always on the look out for gift card with prescription coupons. You never know when you will need one, no one plans on getting sick. Lately, Walgreens has been giving out tons of coupons for free $25 dollar gift cards with transferred prescriptions. But I called and they are ONLY for transferred prescriptions which is why I went to target today. 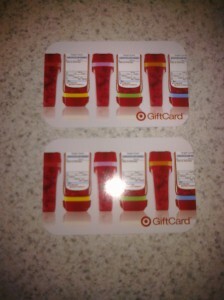 If you have to be sick you might as well get a free gift card (or two)!